Discussion in 'Gambling and Betting Forum' started by JimGunn, Jan 28, 2019. 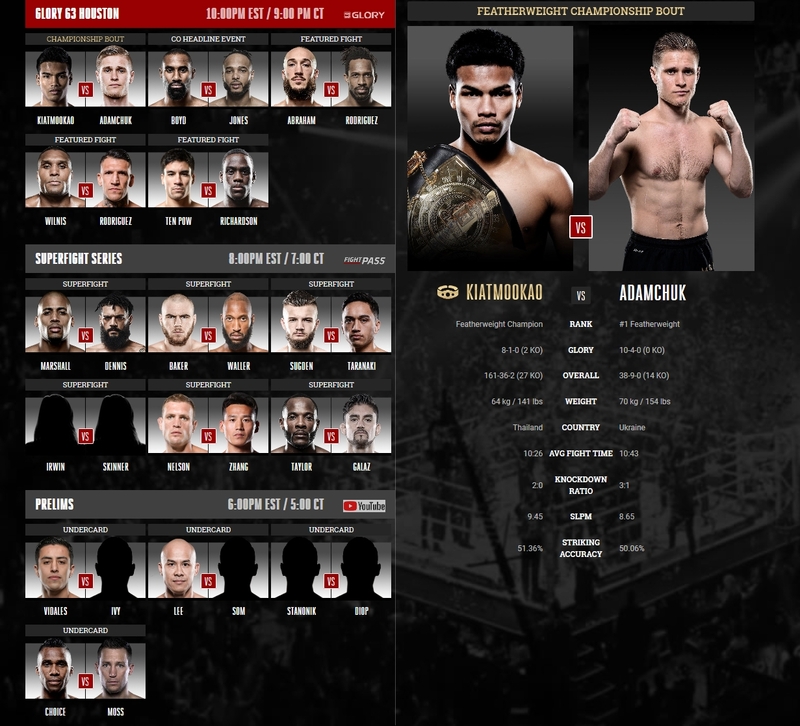 Glory main cards going to join the SuperFight Series cards on Fight Pass in 2019, so basically the whole card back to back on Fight Pass after the prelims on YouTube. I put a couple hundred on Serhii Adamchuk at +170 in the main event. He lost a split decision last time to Petch with one judge of five giving it to him 29-28 and a couple others 29-28 against him at Glory 39 despite Glory's web site saying it was a unanimous decision in that three round tournament bout. This title fight is five rounds though and Adamchuk is always a handful who stays strong throughout the fight. He's been training at Mike's Gym in The Netherlands for a while and surely is prepared for this opportunity. Petch's kick heavy game tends to slow down a little at some point and judges are often confused by how to score his style if he mostly lands body kicks not head kick knockouts like he can against lesser opponents. I think this could be a close fight and Adamchuk's more straightforward European kickboxing style could edge out three rounds, especially if he closes strong in the championship rounds. Also like undefeated featherweight Asa Ten Pow as a favorite again at -213. He might be the best American kickboxer in the lower weight classes and although Nate Richardson is a game opponent with some skills, I'll keep riding Ten Pow until he loses. I think there's value on Chinese eight-man tournament runner-up Wensheng Zhan at +135 despite his smaller stature due to his better experience in Asia as opposed to South African kickboxer Lorawnt-T Nelson who hasn't fought anyone of note yet. Omari Boyd at +140 also has some value in my opinion vs Troy Jones in the co-main event bout. Boyd recently beat a pretty good Glory kickboxer in Alan Scheinson while Jones despite his pre-Glory record supposedly featuring lots of knockouts defeated a pretty mediocre opponent in Casey Greene in his last bout. I also like the larger man and undefeated Charles Rodriguez at -185 vs American journeyman Richard Abraham even though the latter has been training in The Netherlands recently and may have improved his game. Former middleweight champion Jason Wilnis is a huge -1050 favorite and should beat vastly inexperienced American Jacob Rodriguez in this showcase fight, but with no total, there's no reasonable way to bet this fight. Petch has gotten so good under kickboxing rules now, so he is going to be very difficult to beat even by a former champion like Adamchuk, who had absolutely nothing for him this time. Preliminary wins held my loss to only a moderate 2.65 units.